If I had my way, each time I sewed a sweater I'd get to try a new technique or at least a variation on an old one. I love experimenting to see what I think works and what doesn't. I want to know what's quick and easy and what fancy technique I can borrow and translate into a useful method for an everyday cut and sew sweater (like thread tracing or the stretchy Hong Kong finish.) I don't always get the chance to do such things. But this time, because I was sewing something very basic and based on my own old pattern block, I had time to try a new (to me) seam finishing method. Though I've tagged this post as a tutorial, this finish is way too easy for a step-by-step, but here's what I did. 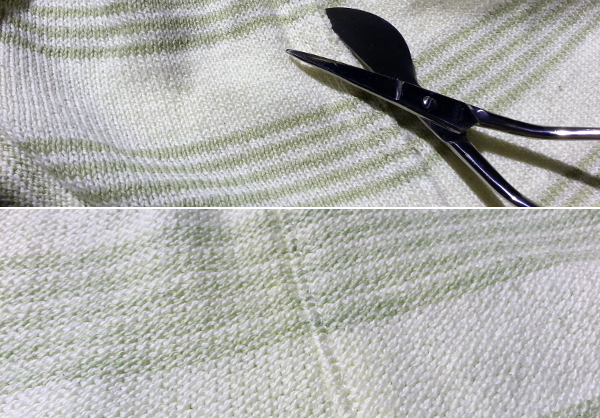 It took just two passes on the sewing machine, each set to a zigzag 0.75 mm wide by 2.75 mm long for this medium weight sweater knit. First I sewed the seam with right side together. I then steamed both seam allowances to one side. Next, from the right side I topstitched close to the seam using my blindstitch foot (Janome foot G), catching both seam allowances below. And that was it. I would have used a top/edge stitching foot, if I'd had one. 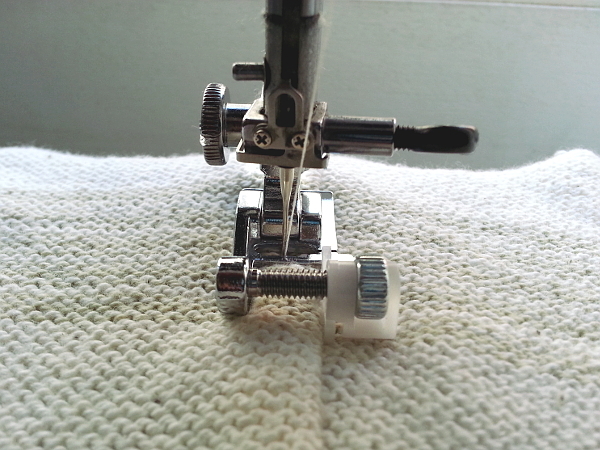 The placement of the little white guide on the blindstitch foot was easily adjusted by turning the guide screw. The flange slipped nicely into the ditch. That's the "right side" pictured above. 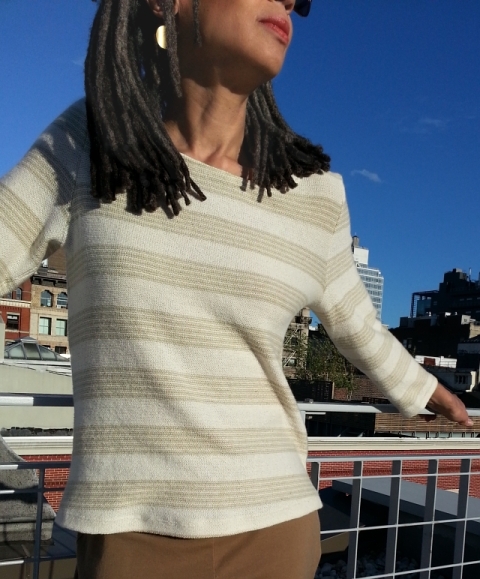 This is my first time that I'm sewing one of my new fabrics and I decided to use the reverse side of the Stripe Jersey for the public side of the sweater. Why? Because I love the look of the purl stitch stripes on a soft, sweater-weight jersey, and I'll almost always choose the more textured side for my right side. On the inside I trimmed the seam allowance close to my second row of stitching with duckbill scissors [affiliate link] making the seam allowance nice and neat. The narrow zigzag doesn't sink into the fabric the way it does on thicker sweater knits, but I still love the way the seams look. The fabric stretches enough so I was even able to topstitch the sleeve seams. Below is where I first tried topstitching the sleeve seams with my walking foot [affiliate link]. 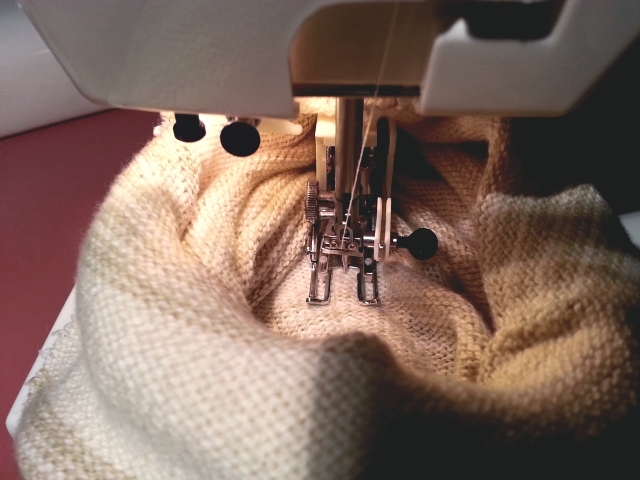 It was definitely neater and easier with the blindstitch foot. 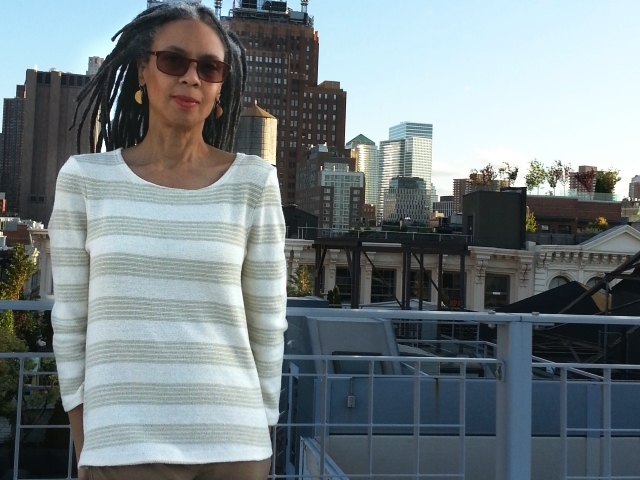 My first summer sweater and it's not even officially summer yet. That really is a first for me! What are your summer (or winter) sewing plans? Join the email list for updates on what's new in O! Jolly! sweater knit fabric shop, special sales, sweater knit sewing tips, and O! Jolly! news. Good question! I've never had issues with purl side snagging, but there are situations where I wouldn't use the purl side for the public side. For instance, if there were longish floats due to a fabric design that used several missed (slip) stitches, I wouldn't use that side. If the fabric were loosely knitted, I would probably keep the purl side on the inside. There could be an issue with openwork too, but either side could have snagging issues with openwork.